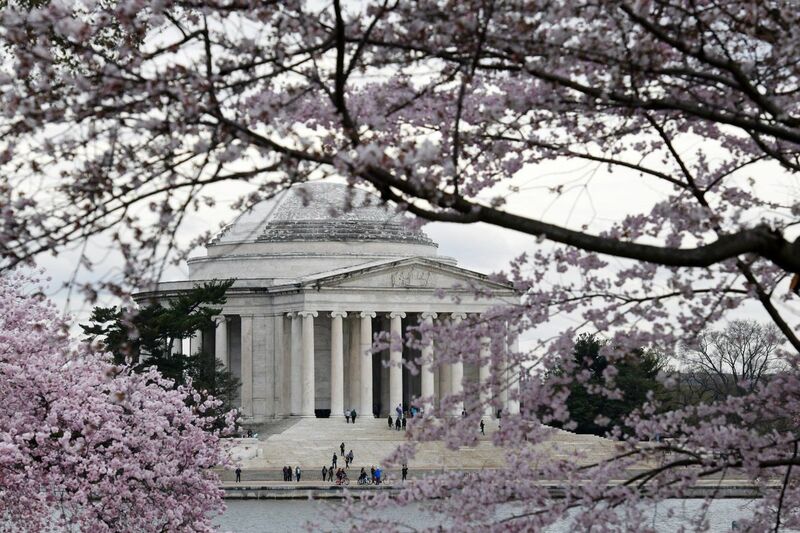 The Jefferson Memorial as seen through cherry blossoms last year in Washington. Washington’s famous cherry blossoms are expected to be at peak bloom from April 3 to 6, the National Park Service said Wednesday. The announcement was an event in and of itself, as acting Park Service superintendent Jeffrey Reinbold plucked the dates from a light pink envelope handed to him by a pink-haired woman on stilts, wearing a pink parasol tutu and cherry blossoms cascading down her legs, as a drumroll played. Attendees sipped strawberry mimosas and complimented each other’s pink attire — ties, pants, scarves and blouses. The spectacle of the annual news conference in which National Cherry Blossom Festival organizers release details of the year’s event is the unofficial kickoff of cherry blossom fever. This year’s festival will run from March 20 to April 14. Woo, I’m jazzed up,” festival president Diana Mayhew said to laughs from the crowd. Gregory O’Dell, chief executive of Events DC, the District’s convention and sports authority, said 1.5 million people are expected to visit the city during the festival’s four-week run, pouring about $100 million into the economy. “Just to put it in perspective: We may have a million people come to our convention center in a year’s time, but we have a million and a half people coming in four weeks,” O’Dell said. Peak bloom occurs when 70 percent of the blossoms along the Tidal Basin are open. Last year, this happened on April 5. The two years prior, peak bloom was on March 25, according to Park Service records. The Park Service said Tuesday the blossoms had reached the first stage in their bloom cycle as green buds had emerged. If temperatures continue to warm with the arrival of spring, Litterst said, the flowers should arrive right on time. Once the flowers open, they could remain on trees for up to 10 days if wind and rain are sparse and temperatures remain mild, officials said.